Following on from the first thread, this is where we can discuss news of Michael Schumacher's recovery. Could Merc put the hashtag on the rear wing? It appears to be empty atm. Edited by PAGATRON, 14 July 2015 - 16:04. I'd rather they just said 'Keep Fighting Michael' instead of sticking a hashtag in front of it. 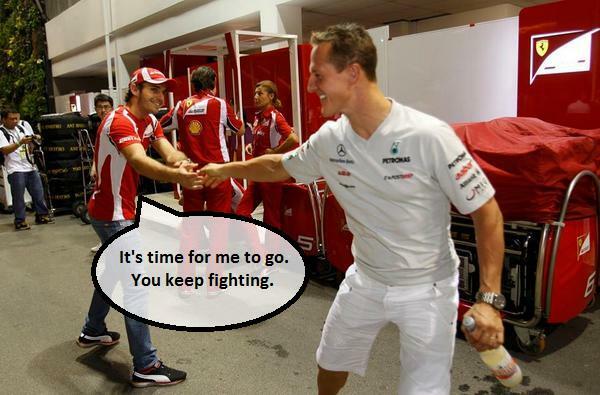 I'd rather it said "Keep fighting, Michael" so as to not imply they want us all to fight him. He's got enough on his plate right now. I don't want to laugh, but I'd like to think MS would at comments like this. Michael's finest driving seasons: 1995, 1996, 1997, 1998, 2000, 2001 and 2004. Michael's pefect driving season when the car was ideal: 2002.... The finest driving season I have ever seen would be 2002. Though Fred's 2012 is a close one, but he never had the car Michael had. Edited by George Costanza, 14 July 2015 - 23:27. Imagine that kind of wet track today... they would cancel the whole weekend. Any wet race... Suzuka 1994, Monaco 1997, European and Canada 2000 and many more, would be red flagged. Michael's pefect driving season when the car was ideal: 2002.... The finest driving season I have ever seen would be 2002. Imagine if he had won Monaco 2004 aswell, 13 race wins in a row. Edited by GoldenColt, 15 July 2015 - 08:15.
come on now. Rain wasn't the cause of Bianchi's injuries. Well it's not the root cause but one of quite a few contributing factors. Many different circumstances in fact that people generally wont even half think of. There have been more deaths in the sport's history in the dry than in the wet... so what do we do? We ban dry races? Edited by Otaku, 16 July 2015 - 04:06. How about we not overlook the fact the FIA has been hugely soft to the detriment of the spectacle for the past few years rather than look for an excuse to wag a finger at someone first chance you get? Please guys, that is seriously offtopic. It really is. Look, if you post messages about how awesome Michael was, then you're inviting other people to post about less celebrated aspects of his career. So don't do it. There's a Nostalgia Forum where a thread like that is probably now appropriate. The right answer is for this thread to be off the front page until we get news that he's talking, walking or up and about and attending F1 races again. It is definitely NOT the place to be discussing what happened to Bianchi. You just know how such suggestions are taken by the regulars over there, don't you? We're all one big happy family as you know, so they'll be happy to see you all. Yep, must have forgotten that momentarily, sorry. For the OT too. No, he will never race again; no, he may never walk again; he may never talk again, for all I know. But, on the other hand, he may. True. After my father's heart arrest, when they started to wake him up and he was laying in his bed with 1 eye open in coma, nobody knew he would return home normal in 1 month. You never know. I dislike how Finnish media still quotes Philippe Streiff's claims that Michael is paralyzed but can sit in a wheelchair, even thought it was quickly rejected by Kehm. Schumacher's manager Sabine Kehm was quoted by the German newspaper Bild as also rejecting the report based on Streiff's comments. "I can only wonder about these statements of Philippe Streiff," she said. "He certainly has no contact with Professor Saillant or with Corinna. "Between Mr. Streiff and Michael, there has also never been a friendship," added Kehm. The fact is that we know nothing about Michael's condition. Except it's that bad that he cannot show to public and his family doesn't even want to talk about his situation. It's been a hell of a lot longer than a month, the signs aren't good at all let's be honest. I think it's fair to say now we will never see Michael in public again, we may never get another update either. At the end of the day his family do not wish for the public to see or know his condition and that alone tells you everything. Had he been able to recover something close to his old self, it would have already happened by now. Edited by Silverstone96, 19 August 2015 - 21:58. Medical breakthroughs occur almost on a daily basis...have faith for a good outcome for Michael. I think it's time we left Michael and his family in peace. There has been no news for over a year now and it's clear the family are getting on with their lives and normally as they can now. If they are at peace with the situation, even if only outwardly, then so should we. No and nor is there likely to be for the foreseeable future. What does that mean? Does he see the world around him? Is he a vegetable? Edited by SR388, 25 August 2015 - 00:54. A very similar thing happened to Dutch prince Johan Willem Friso (avalanche). He didn't survive as long. I got the impression already with Friso back then that such well-off and famous individuals are simply not allowed to pass away like regular mortals. My sympathies go out to them. I would would wish it upon anyone to be in a state of zero % chance of even partial recovery, and being such a strain on my loved ones. And being barely conscious, unable to sign any papers to relievve myself and especially others of my existence. Michael may well have (had) a different take on life, but I sure wish upon him an opportunity to re-affirm his wishes. A few short lucid moments with his family, and their compassion and respect of his wishes. An absolute equal racing legend to Senna IMO, I am not sure Michael was the lucky one in their respective final accidents. Unless I still possessed the ability to actively share love with my family and friends, I would no prefer Michael's fate for myself. And Senna's was so dreadful already. Did both have to pay for their success? Other drivers get killed in various ways, but these are two undisputed greats of the sport, and basically in the same era. I deeply hope for Michael and his family to get something out of his existence still. A long life of only fighting is not what I wish upon anyone. So much fighting for so little gain. Only worth it if it works out. His situation, thanks to modern medicine, seems to benefit no-one. The family should just let him rest in peace. I suspect that would have happened a long time ago to the average person without his fame and money. Probably that he answers to inputs. Both accidents took place while skiing, but where Michael hit his head, Friso was caught under an avalanche that deprived him of sufficient oxygen for almost half an hour. Though the latter was successfully reanimated, tests later showed that he had suffered "massive" damage to his brain. Though there were some reports of Friso being minimally conscious months after the accident, the same words apparently used by Hartstein, we've been told a lot more positive news about Michael than was ever said about Friso after the latter's accident. That said, the Schumacher family has unfortunately been very reluctant to talk about Michael's situation. Most of what we know might therefore be only a small part of the overall picture. Rather an understatement, it's as if he has disappeared from Earth and he is no longer here. I can understand need for privacy but I feel Bianchi's family understood more the public side of his accident I feel. It is their decision though. Very sad in recent years so many head injuries. It's a terrible outcome most of the time so reducing them should be looked into again. The fact that members of his family are enjoying themselves does not say anything at all about Michael's state of health. Until there is an update or he is even seen again it can only be assumed profess is minimal for Michael. This doesn't really tell a lot. People can be happy in a moment while generally feeling sad. And of course time also heals wounds (to some degree) - they all need to move on in life and make the best out of it.